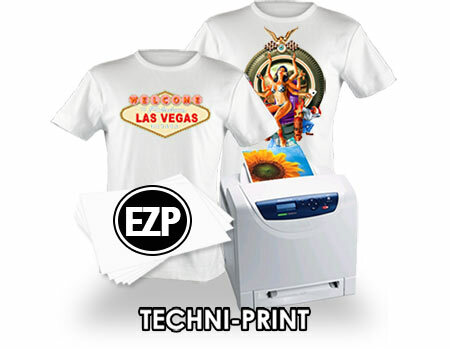 "High & Low Temp Laser" >>New!<< TECHNI-PRINT® EZP Heat Transfer Paper Papers (Replaces 4.0) is the latest color laser friendly heat transfer paper. It is designed for both oil and oil-less laser printers, copiers and can be peeled hot, warm or cold. This transfer paper is for the heat transfer (on white & light color blanks) of photos and images to T-shirts, sweatshirts, mouse pads, coasters, puzzles, handbags, binders, pad folios, paper, leather, magnets, wood veneer, nylon and more. Choose garments that have a tight weave. This is particularly important when transferring to sweatshirts. Can be applied by Heat Press or Home Iron! Heat Press Instructions | Home Iron Instructions | Transfer Cutting Tips!